Jazz has a long history of interpreting music from the American songbook. Latin America has just as lofty a collection; many were written by the tremendous Mexican composer Armando Manzanero. Manzanero’s legacy is well established. He has received a Grammy Lifetime Achievement Award for his work as a singer and composer. His wonderful compositions have been performed by a broad array of artists, including Elvis Presley, Tony Bennett, Frank Sinatra and Christina Aguilera. 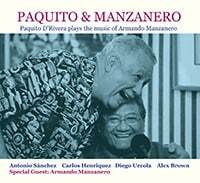 For his latest recording, Paquito & Manzanero, the great woodwind master Paquito D’Rivera illuminates the incredible work of Manzanero in Paquito’s favored idiom, Latin jazz. D’Rivera is no stranger to the many diverse styles of Latin music and is happy to incorporate many of them in his projects. 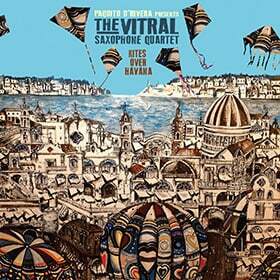 The album has beautiful arrangements by band members Alex Brown and Diego Urcola. From tango to Venezuelan waltz to straight bebop, the music on Paquito & Manzanero highlights the adaptability of these fantastic melodies to any musical style. Bill Evans even performed his own arrangement of “Esta Tarde Vi Llover,” which he called “Yesterday I Heard The Rain,” here rearranged by Alex Brown. The recording is a special collaboration. Even more so, as Manzanero was on hand to supervise the arrangements and lend his vocals.